Being offered video games that encouraged physical activity didn't help children, but one inactive game did help their grandparents' cognitive skills, two separate studies found. In the first study, researchers offered a new video game system to children 9 to 12 years of age, with a body-mass index between 50th and 99th percentile. The children were randomized to receiving two active or two inactive video games. Physical activity was monitored with accelerometers for 5 weeks over the course of a 13-week experiment, as well as diaries and machine-recorded gaming sessions. Results appeared at Pediatrics. There was no evidence that children receiving the active video games were more active in general, or at any time, for that matter, than the children who received inactive video games. "[A]lthough children can do moderate or vigorous [physical activity] with active video games in laboratory settings, they either did not elect to play the provided games at that level of intensity, or compensated for the increased intensity by being less active at other times in the day," the authors noted. Move over, sonny. Grandpa wants to take a crack at the game controller. A different set of researchers reported that playing World of Warcraft boosted cognitive functioning for older adults, particularly for those who had scored poorly on cognitive ability tests before playing the game. The researchers said in a press release that they chose World of Warcraft because it is cognitively challenging, socially interactive and offers new situations during game play. World of Warcraft is an expansive, immersive environment that lets millions of players in a virtual world populated by creatures, characters and towns, and even offers an in-game economy and other complex features. Researchers first tested the cognitive functioning of study participants, aged 60 to 77, to set a baseline for cognitive abilities including spatial ability, memory and how well participants could focus their attention. The experimental group of study participants then played World of Warcraft on their home computers for approximately 14 hours over the course of two weeks, before being re-tested. 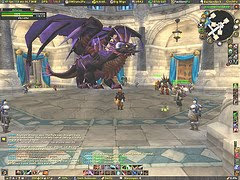 A control group of study participants did not play World of Warcraft, but were also re-tested after two weeks. Results appeared at Computers in Human Behavior. The group that played World of Warcraft saw a much greater increase in cognitive functioning, though the effect varied according to each participant’s baseline score. Among participants who scored well on baseline cognitive functioning tests, there was no significant improvement after playing World of Warcraft. Researchers recorded significant improvement in both spatial ability and focus for participants who scored low on the initial baseline tests, but no memory improvement. The people who needed it most, those who performed the worst on the initial testing, saw the most improvement, the researchers noted.